Alchemist’s Dream 2017. 48″H x 48″W x 3″D, Stainless steel, slumped and etched glass with glass drops. The Air is Rare 2016. 70 x 34 x 3 in. Stainless steel, etched and slumped glass with glass drops. After Darlin Run 2018. 65 x 32 x 3 in. Plum brown patina steel, slumped and etched glass with glass drops. I Am Water 2018. 40 x 40 x 3 in. Stainless steel, slumped and etched glass with glass drops. Alchemist’s Dream 2017. 48 x 48 x 3 in. Unspeakable Alchemy 2018. Fabricated and patina mild steel and hot worked glass. 24 x 70 x 6 in. I Am Water, 40 x 40 x 3 in, Stainless steel, slumped and etched glass, glass drops. After Darlin Run 2018. 65 x 32 x 3 in. 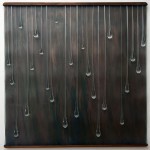 Plum brown patina steel, slumped and etched glass with glass drops. Art becomes more necessary in a fast paced, social media and tech driven world. It can mean something more to a viewer when it speaks to one’s inner self. This is where we find the place to contemplate, reflect and recharge. Art has the power to rivet us to that moment, whether visual or through sound. When someone says – “that moved me to tears,” or “this work has replaced the air in the room,” or “it took my breath away,” they are speaking of the poetics of space. Art is about connecting the plane of beauty to the sublime. It is the window to that other dimension of stillness, slowing down between looking and experiencing. Art made with glass has that power. This work is the embodiment of all that came before, the trial and error, the techniques or invention, as it moves toward the idea of tranquility fully formed. 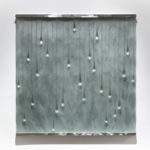 Kathleen Mulcahy’s glass panels imitate the look of liquid elements in nature. But there is nothing of nature’s seemingly random behavior in these compositions. Instead, Mulcahy simplifies the irregularity of organic shapes to create controlled arrangements. Her glass elements may be prompted by something observed in nature, but they have been refined to a purified geometric form. Works in this series involve hot-worked and flame-worked glass shapes attached to slumped and acid etched plate glass backed by a fabricated steel sheet. With a Masters of Fine Arts in glass sculpture and three-dimensional design from Alfred University, she directed glass studio programs at Bowling Green State University in Ohio and Carnegie Mellon University in Pittsburgh then went on to develop the Pittsburgh Glass Center, one of the top public access glass studios in the nation. for which she was honored as Pennsylvania Artist of the Year in 2013. During this time, her own work — installation pieces, cast glass, blown glass objects — evolved into unique and poignant statements. Her glass works are in many public and private collections including the American Craft Museum, The Corning Museum of Glass, The Carnegie Museum of Art, The Renwick Galleries of the Smithsonian Institution and The Westmoreland Museum of Art. Mulcahy has won numerous awards including grants from the NEA, the Pennsylvania Council on the Arts, and a Fulbright.